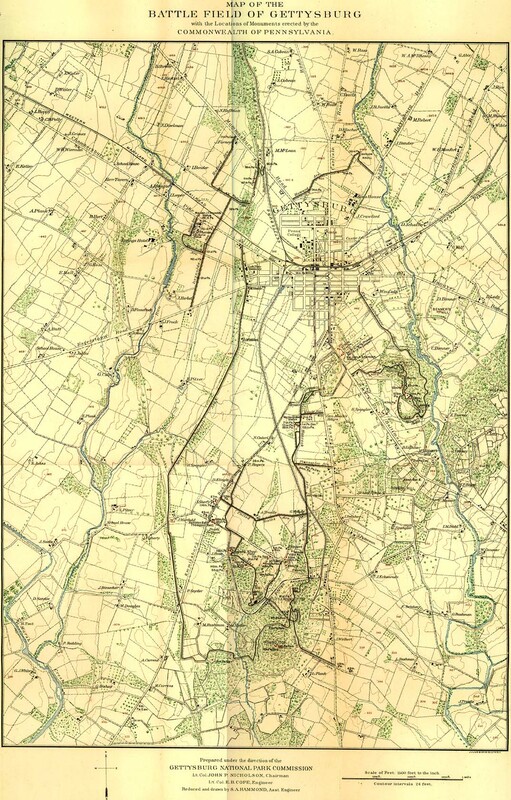 This map is undoubtedly THE finest representation of the battlefield of Gettysburg, as it appeared at the height of the U.S. War Department park-building effort. 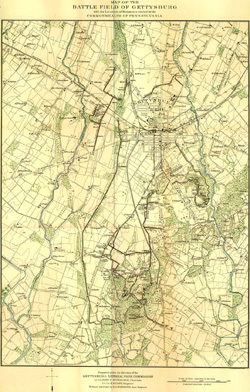 It is found in Volume 2 of Pennsylvania at Gettysburg in both the 1904 and the 1914 editions of the publication (the 1893 edition does not contain the map). Prominently represented on this map are the newly built War Department avenues, all of them conspicuously labeled. Some of these original avenues have been rerouted or even removed over time, (eg: Sykes and South Confederate avenues have been rerouted. Webb and Chamberlain avenues have been removed) so that this map serves as an invaluable documentation of the paths followed by the original roadways. Stone walls and fence lines are plainly delineated. The courses followed by the Electric Railway and the Round Top branch of the Gettysburg and Harrisburg railroad are easily traced across the field. Topographical features and terrain elevations are engraved on this drawing, as well as period buildings and structures such as the Springs Hotel on the first day's field. As an added plus, the location of all Pennsylvania monuments that were located on the field in 1904 are marked in red on the map. The Pennsylvania Memorial appears on the 1914 edition of the map. The map measures 15½ x 24 inches. It was scanned in 4 pieces prior to being assembled into the map shown here. The map was obtained as a special purchase of the GDG expressly for its display in the GDG map room.